They don't call it Muny magic for nothing! And we've been so blessed to see two shows there already this summer. Grace was excited for Charley's first Muny! 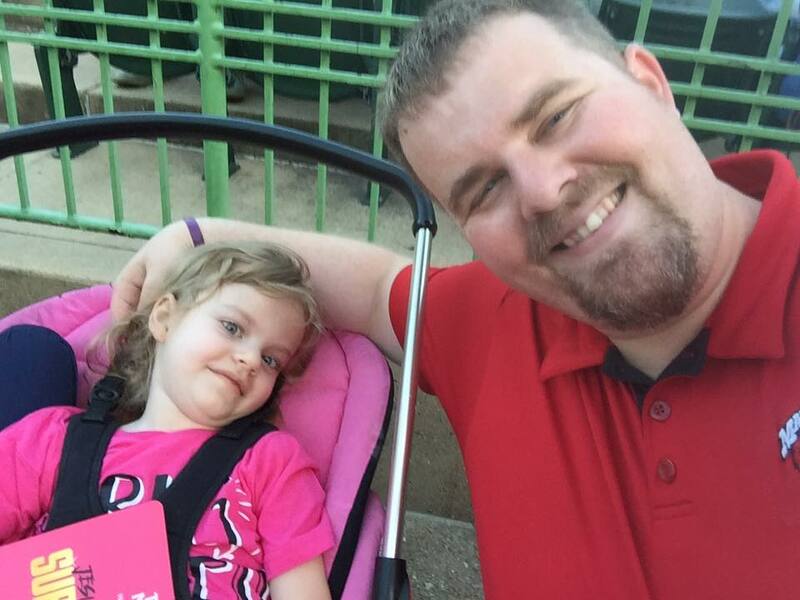 For as long as I can remember, the St. Louis Muny has been a great place to make some wonderful family memories. Mom and dad took Johnny and I to a show each summer, and that's really where my love of theater began. 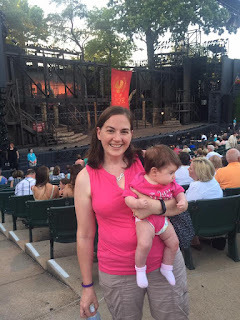 And I continued to make the summer trips to the Muny as I became an adult as well. Grace and daddy hanging out before the show. The first summer Kyle and I were dating, we made a trip to the Muny almost every week to see the shows. Kyle only skipped one week because he refused to see High School Musical with me. But we've always had a really good time there together. Grace's first show was Aladdin, when she was just ten months old. 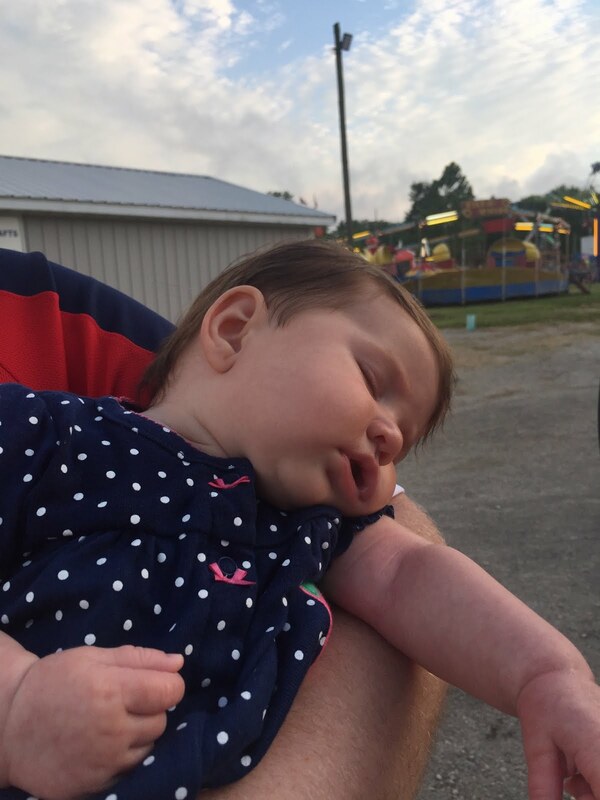 She seemed to enjoy the music, and fell asleep in my lap for the entire second act. That same summer, we took her to see Dreamgirls, and even though we left at intermission, it was still a great show. We also added Seuessical, the Musical to her repertoire a few years later. 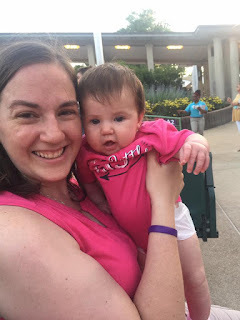 It seems like it had been a few summers since we had made the trip to St. Louis for the Muny. But we've already been to two shows this summer, and we've loved every minute. Watching the Muny is hard work! 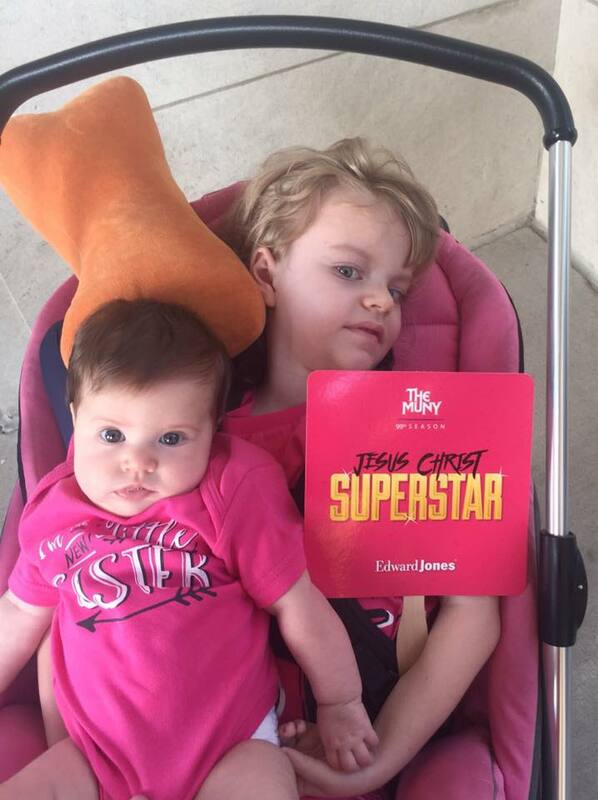 Sort of on a whim, Kyle asked me if we wanted to take the girls to see Jesus Christ Superstar on opening night. It's always been his mom's very favorite show, and even though she had to work that night, we thought it would be fun to take the girls. As soon as we got off work that night, I fed Charlotte and we loaded up the girls. We decided it would be easier to find a nice shady spot to feed Grace when we got there, and we did. 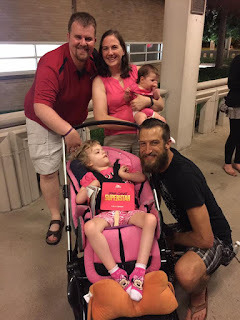 It was the first time we brought Grace that we had seats in the accessible rows, and it worked out great. Grace got to sit in her own chair, and I think she was more comfortable. 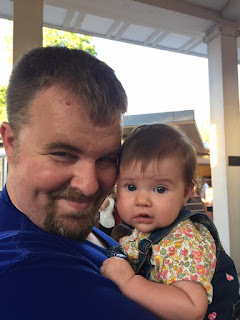 While we were sitting in the courtyard feeding Grace, I started telling Kyle that I had been watching the news that morning and they were talking about some of the cast. 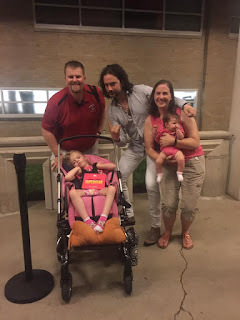 He started to look up the actors on his phone, and found that American Idol contestant Constantine Maroulis was playing Judas. Since we try to give Grace as many experiences as possible, Kyle tweeted to him and asked about meeting after the show. When we got done feeding Grace, we made our way to our seats, and enjoyed the truly fabulous show. The music was just wonderful, and the cast was great. There's just something about watching a show under the stars at The Muny that's just magical. 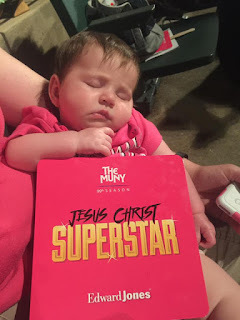 Charlotte slept a bit during intermission, but was very content the entire show to sit on my lap. 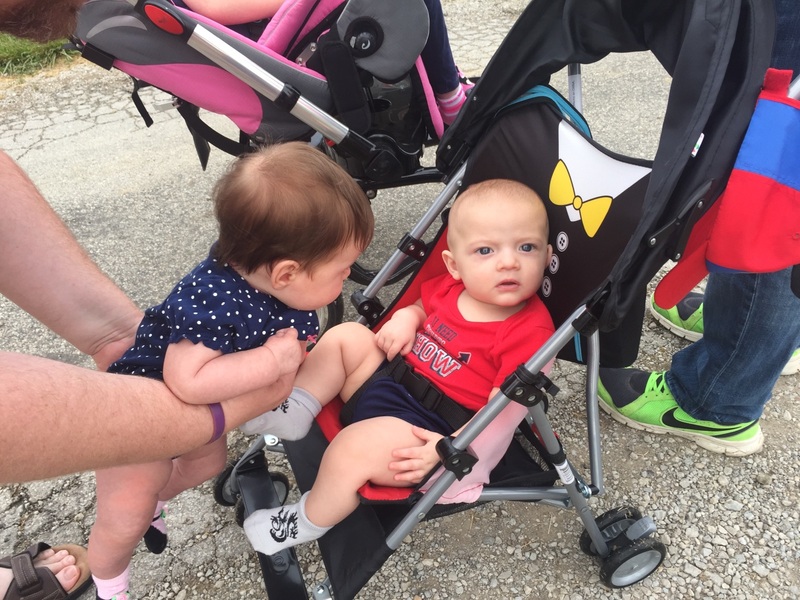 After the final bow, we waited a few minutes for some of the crowds to clear out, and Kyle was still hoping we might have a chance for Grace to meet Constantine. As we gathered up our belongings, Kyle was a little disappointed that we hadn't heard anything. But as we were heading to the van, we noticed a crowd gathering around one of the entrances. So, we decided to wait a few minutes and see if we could meet him. And it worked! We put the girls in a small line where the crowd was waiting to get autographs on their programs. Kyle introduced Constantine to Grace and asked if he would take a photo with our girls. He greeted Grace warmly and asked how she liked the show. It was a really special moment for us to watch him talk to her. After Constantine came through the line, another actor, Bryce Ryness, who played Jesus, also stopped by to greet our girls. What touched me the most was that they both specifically interacted with Grace, not just us. Even though Grace can't necessarily respond to them, it meant so much that they made her feel important too. 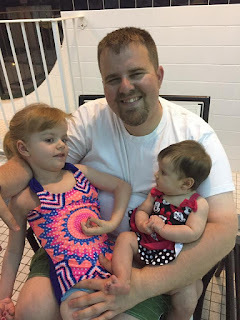 Before we left for the show that night, I had some reservations about taking both girls. Would it be too hot? What if Charlotte cried a lot? What if it was too late when we got home? 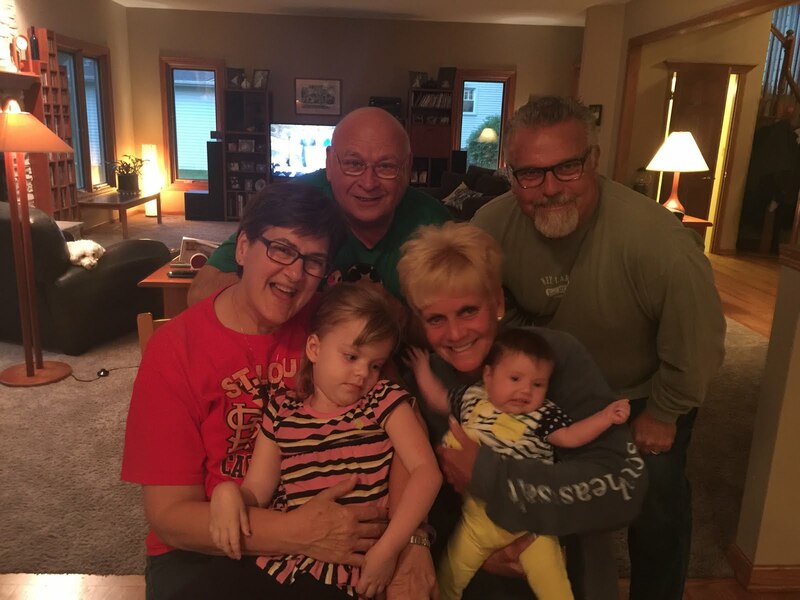 All my worries were quickly gone once we got there, and enjoyed a family night together making memories. There is just so much truth to the phrase, "Muny magic." 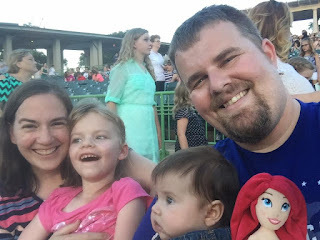 So, when the next week rolled around, we thought it would be fun to take the girls to see The Little Mermaid. It's one I'd never seen on stage before, even though I have seen the movie a zillion times. We got accessible seats once again, and even though Grace sat on my lap for a bit in the beginning, it was nice for her to have a place for her chair too. It was another beautiful night, and the big outdoor fans do so much to keep patrons from getting too warm. The music was fantastic with both songs we knew and some that we didn't. They had some really great puppeteers too throughout the performance. My personal favorites were Ursula's tentacles. But the highlights of the performance for both of us was during one big production number when two young actors were wheeled out in wheelchairs as part of the dance ensemble. Kyle and I both teared up watching them, knowing what a bright spot it was for these youngsters. They had a chance to "dance" on the Muny stage, something they probably never imagined they would be able to do. 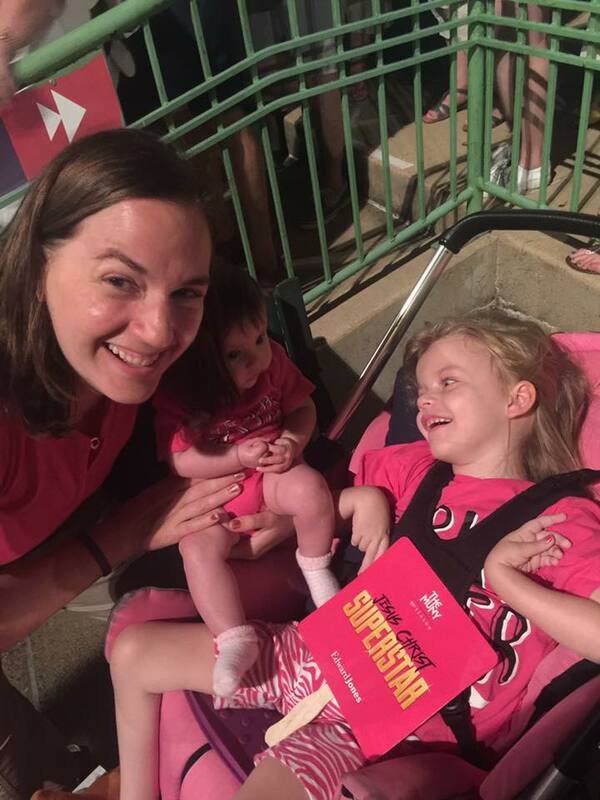 Special thanks to the Muny for honoring inclusion, and letting people of all abilities know that anything is truly possible. I still get goosebumps just thinking about it. 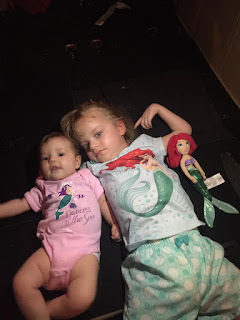 This time, we didn't stick around afterward to meet any of the actors, we just loaded the girls up into the van in their mermaid pajamas. Charlotte, who slept the entire second act, entertained herself the whole drive home, and was still wide awake at midnight when we pulled the van back into the drive. I think she was still excited from the show. On the drive home, Kyle and I started talking about how much we thought Grace actually got out of the experience. 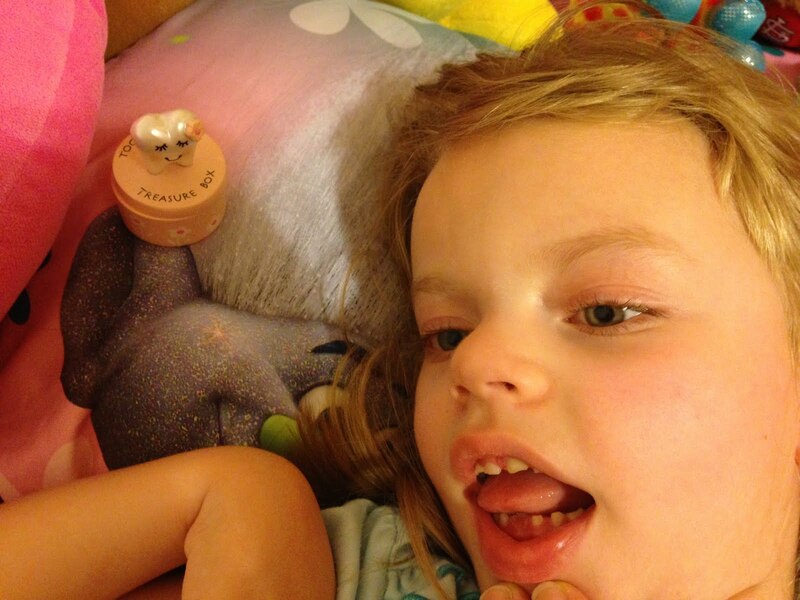 Since she's not able to tell us, we don't know exactly how much she sees or hears. I feel like she is able to see some things right in front of her face, as she still responds to the pictures in books. And I know she hears us talking to her, but neither of us know how much she takes in at something like The Muny. But we didn't let that worry us. One thing we do know for certain is that Grace loves to be with us. And that feeling is definitely mutual for all of us. We feel so blessed to have so many wonderful opportunities to make memories together on our Grace-Filled Journey. Whether or not we get to any more Muny shows this summer or not, we will always remember our nights filled with "Muny magic." 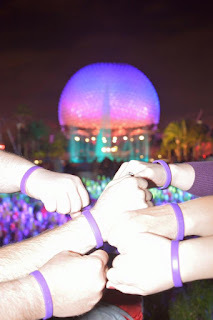 There's a decent chance that if you are reading this, you know what a Gracelet is, but for those who don't, a Gracelet is the purple rubber bracelet that hasn't left my wrist for the better part of the last two years. My family has given out thousands of these purple bands, which feature the phrase "A Grace-Filled Journey" on them for awareness of my five-year-old daughter Grace's battle with the rare genetic condition Infantile Neuroaxonal Dystrophy or INAD. Our first photo with our gracelets. Mine said that too. Or at least it used to. With constant wear, the letters on my band have faded from sight like a sand castle washed away by a wave. There's also a small cut on my band, a victim of some careless scissor work when I tried to remove the hospital band from my wrist after we made it home with Grace's little sister, Charlotte. 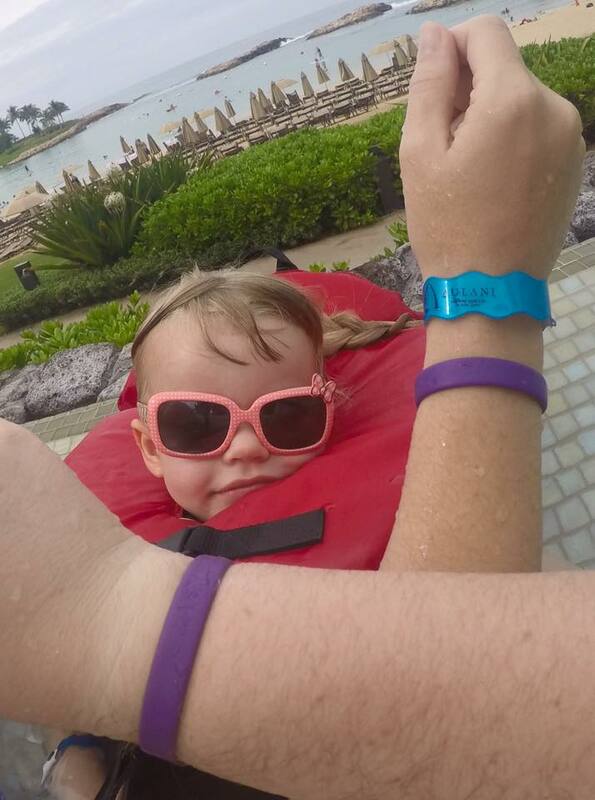 Gracelets on Grace's Make-A-Wish trip to Hawaii. Even with the damage, the Gracelet has been on my wrist, looking worse for wear but still hanging on. That is, until Sunday, June 25. That Sunday morning, with a slight pull, my tear in my Gracelet became terminal. Instead of a perfect circle of purple, I now held in my hand a strip of rubber with two jagged ends from where the separation had occurred. Gracelets at Red Rocks Park in Colorado. I did this of my own volition as a part of the children's sermon at our family's church. 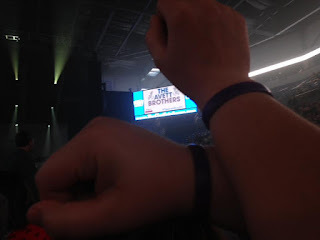 I wanted to prove a point that while this bracelet hadn't left my wrist for two years, it was what the bracelet represented that was truly important. Sort of how the cross means something more important to Christians. The Gracelet represents a reminder to embrace the positive in everything you can, because life is extremely short and unpredictable. It represents the support that we have received and is a reminder of all of the people who care for our little girl. But most of all, it represents our family's fight to give Grace the best life possible while we still have her on this earth. We strive to give Grace these special "Wow" moments, even if she can't fully comprehend what is going on. 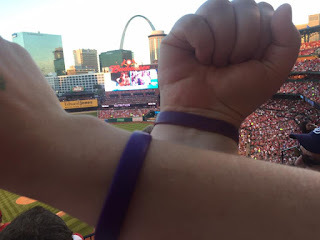 We have had the opportunity to present Gracelets to pro athletes like Zac Kerin, Steve Cishek, Keynan Middleton and Lisa Roberts and make them part of our story. 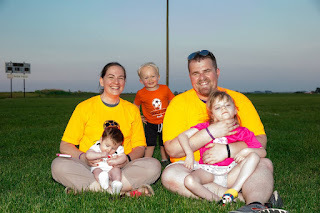 We have watched as team after team has embraced our family as part of their own, hosting Grace games and even A Grace-Filled Tourney this upcoming volleyball season. We have marveled at the places that friends have taken their Gracelets, like Japan, Scotland England and all over the United States. 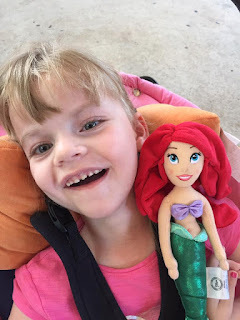 The fact that we can share some of those photos on our blog and on our Facebook page never fails to make us smile at the impact that Grace has had on people. Ultimately, it doesn't matter that I am now wearing a new Gracelet. This one will likely get stretched out or cut or damaged in some other way eventually, but what this little purple band represents will never go away. I don't need a band to help me remember Grace; she's in my thoughts constantly and I imagine she always will be. But I could use a reminder sometimes that life is way too short to be angry or negative or unkind. That's why I'll always wear a Gracelet. That was the theme of this year's Illinois Press Association convention, held in Springfield June 8 and June 9. And it couldn't' be more true. Our family definitely believes in newspapers, and has for generations. I'm the fourth generation in my family to work at The Journal-News over the years, and I couldn't be more proud of the way that my family has contributed to our community for more than 70 years. Yes, we definitely believe in newspapers. 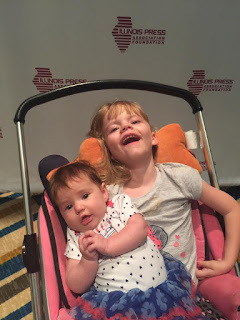 As far as Kyle and I can remember, Grace has attended each of the Illinois Press Association conventions since she has been born. 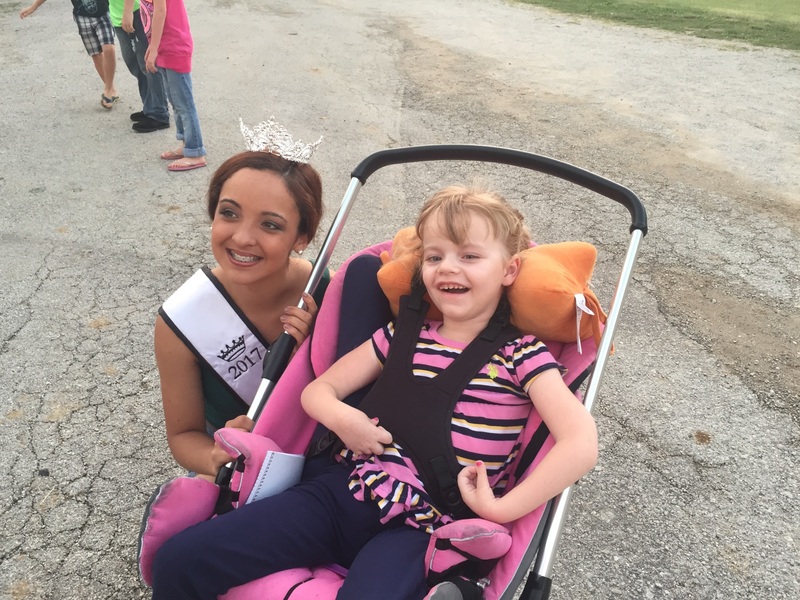 She has also joined us for several Southern Illinois Editorial Association conventions, and is always the bell of the ball. So, we were very excited this year to have Charlotte join us at this year's Illinois Press Association convention as the newest member of the newspaper family. She ended up sleeping through most of it, but she certainly stole the show when she was awake! This year, we headed up to Springfield after Kyle got off work on Thursday night so we could spend the night. I was asked to help with one of the sessions in the morning, so it was easier to be in Springfield already. And it gave us a chance to take the girls swimming the hotel pool. 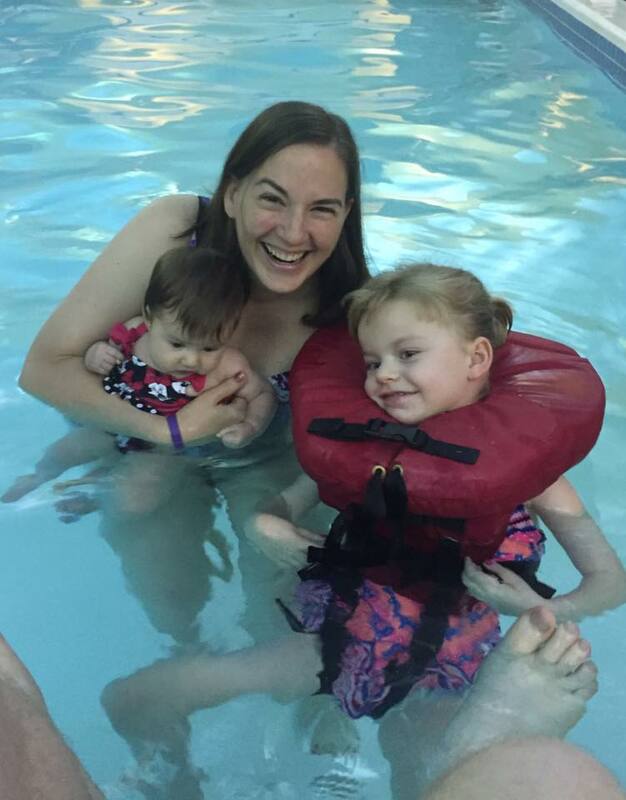 Grace has always been a water bug, and it was fun to see Charlotte swim for the first time too. They only made it about a half an hour in the water, but it was one of the best parts of the trip. 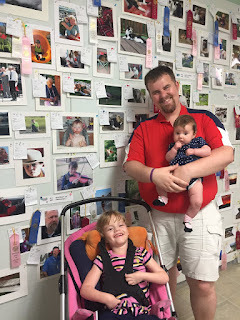 The next morning, Kyle graciously offered to take Grace to physical therapy across town, so that I could help with one of the workshops. The IPA had asked me to interview Art Cullen, editor of the Storm Lake Times in Iowa, and winner of the Pulitzer Prize for editorial writing. I was so honored they asked me to interview him for a session called "Why Real News Matters." Mr. Cullen took on some big agricultural companies in Iowa as part of his editorial series and talked about why it's so important for journalists to keep fighting the good fight and making a difference in their communities. Charlotte was thoroughly impressed - she slept through the whole thing on my mom's lap. After that, it was time to meet Kyle and Grace for the annual awards luncheon. Kyle had to stop at Kohl's after physical therapy, because I might have forgotten to pack any clothes for him to wear to the luncheon. I have to say he was a pretty good sport about the whole thing, and got a beautiful new purple dress shirt and tie out of the deal. We found a table in the back with my mom and dad, that way we could make a quick escape if Charlotte was unhappy. But she did great, and we enjoyed the meal and conversation with other fellow journalists as well. This year, the newspaper won 12 awards in advertising and 11 awards in editorial content. 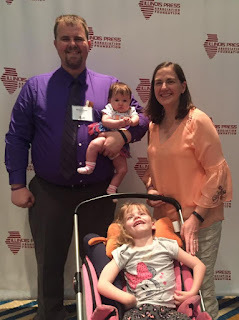 I was most proud to win an award for my column writing, A Grace-Filled Journey, many of which can be found here in this blog. Kyle also won an award for his sports column, and we were very honored to be recognized. It's always nice to win awards, but it never changes what we do here at the paper. We will continue to cover the communities of Montgomery County to the best of our ability, sharing news that makes a difference. 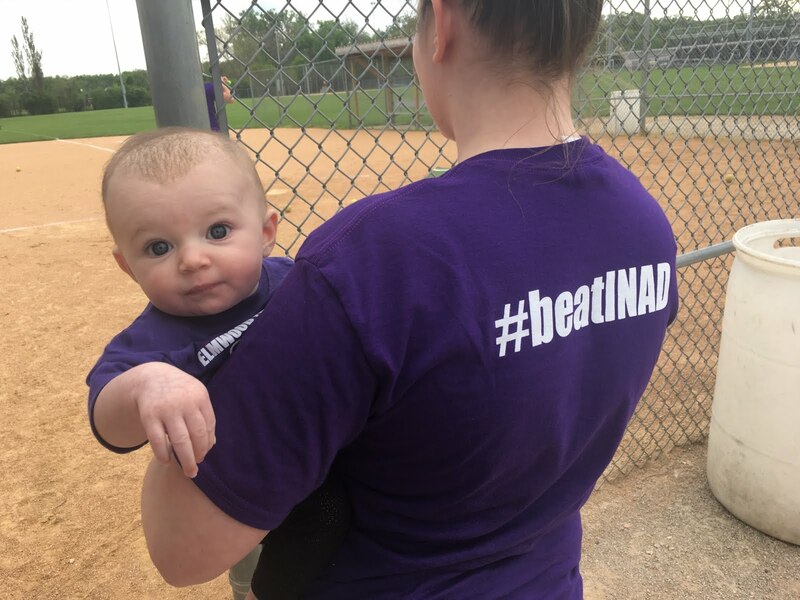 We are so grateful to all of our readers who have joined us in the fight to #beatINAD and follow our Grace-Filled Journey. Yes, in our family, we believe in newspapers, because we know they make a difference. It's one reason we have been able to raise so much funding and awareness for INAD. And we won't stop until families around the world don't have to fight this battle anymore. My dad has always said I have ink in my veins, and I wouldn't have it any other way. 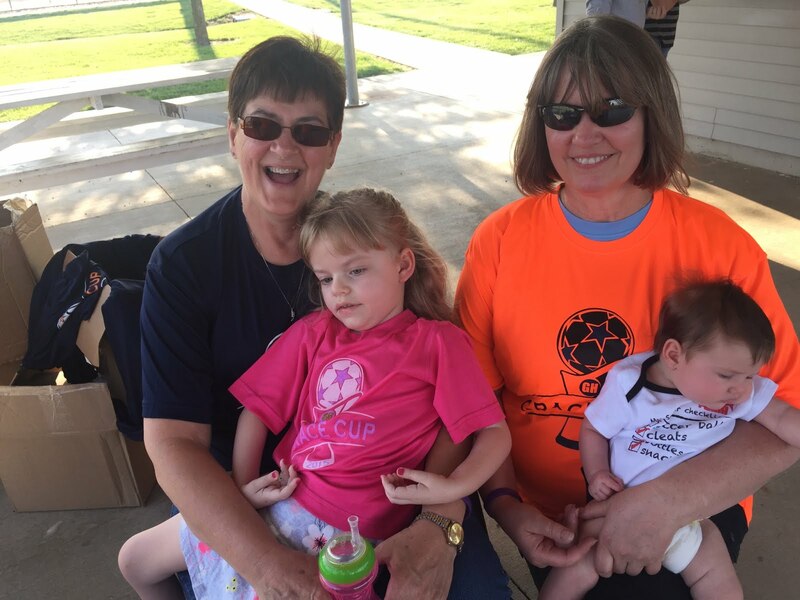 The third annual Grace Cup senior soccer all-star game, held Saturday, June 3, in Raymond, raised $1,178 in donations for infantile neuroaxonal dystrophy research in honor of five-year-old Grace Herschelman, who is battling the rare genetic condition. The game featured 32 players from 11 different schools, Lincolnwood, Hillsboro, Litchfield, Pana, Staunton, North Mac, Williamsville, Riverton, Roxana, Carlinville and Greenville. The game would be competitive and would have been even more so if it had not been for Greenville goalkeeper Noah Matthews, who made several acrobatic stops in the first half to give the Blue Team a 3-0 halftime lead. 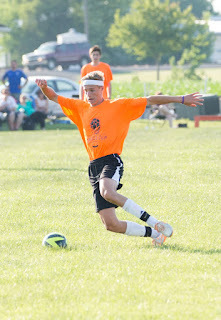 Both teams would score twice in the second half as the Blue Team defeated the Orange Team 5-2. Our girls getting ready for the Grace Cup. 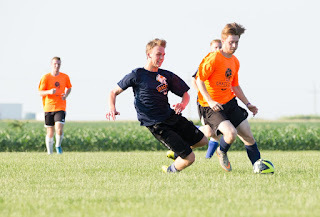 Jack Epley of Pana, Koltan Page of Carlinville and Jake McLeod of Pana would score in the first half for the Blue Team, with Page and Litchfield's Spencer Bloome scoring in the second half. Drew Ratliff of Roxana and Jacob Morse of Williamsville would score in the second half for the Orange Team. Ratliff and Matthews would be named MVPs for their respective teams and would receive a Grace Filled Journey soccer scarf. 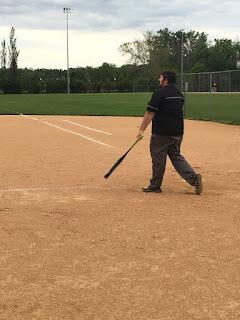 While the game was impressive, the generosity of those in attendance was even more so as the event, which had no entry fee, brought in close to $1,200. Nearly half of the $1,178 raised during the game came from donations from the Lincolnwood soccer program, who ran the concession stand at the Grace Cup, held a benefit alumni game beforehand and contributed seven players to the Orange Team roster. 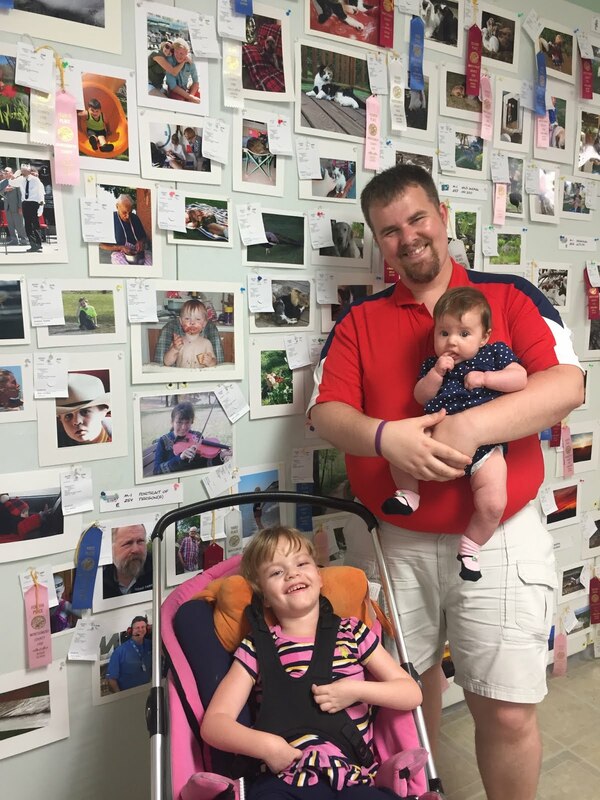 "We can't thank everyone enough," said game organizer Kyle Herschelman, the father of Grace Herschelman. "Without Joe and Ashley Webb and the rest of the Lincolnwood soccer program, this event wouldn't be nearly as successful as it has been the last three years. We are honored that they are part of our journey." Being the star sure is hard work! The Herschelman family also received help from several jersey sponsors this year, including Maverick Steaks & Spirits and Wendy's of Litchfield, which lowered the costs of doing the game and increased the donation to INAD research that will be going to Washington University in St. Louis. 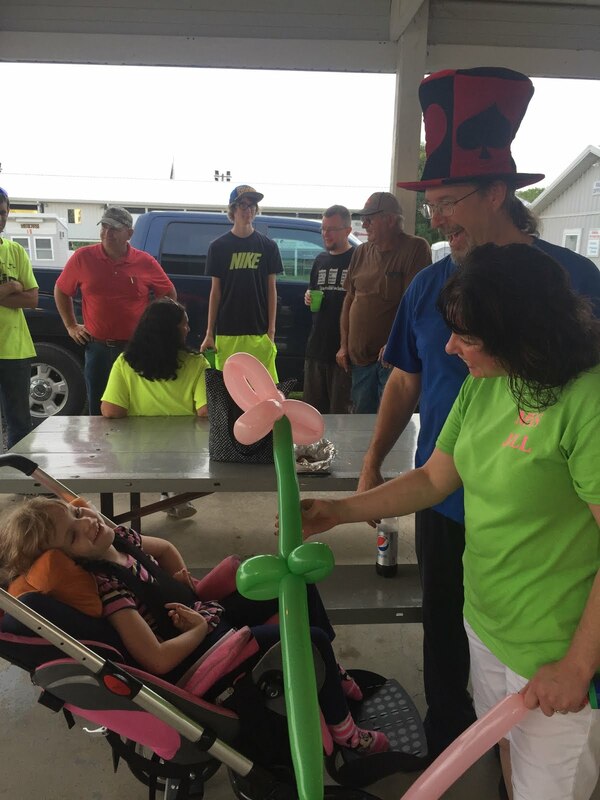 "The amount that our community has been able to raise for INAD research is just amazing to me," Herschelman said. 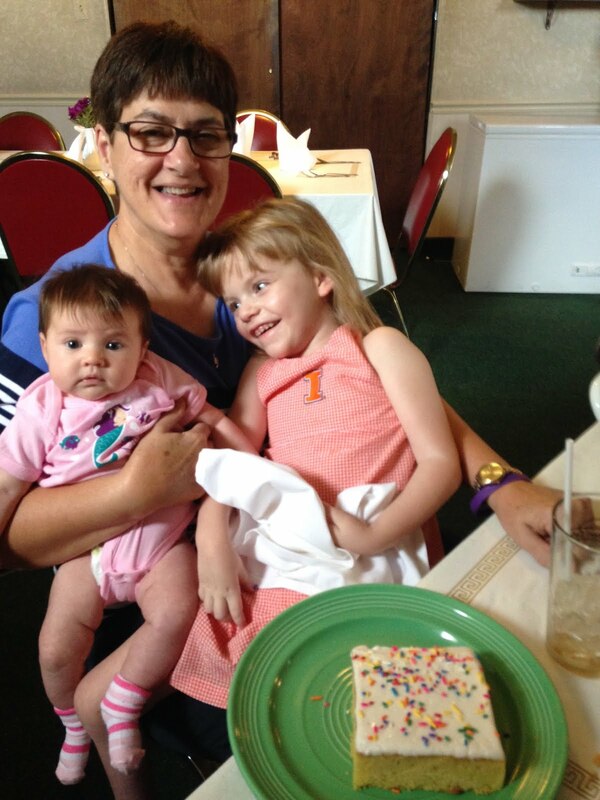 "But even more important is that we were able to share Grace's story with dozens of new faces today." 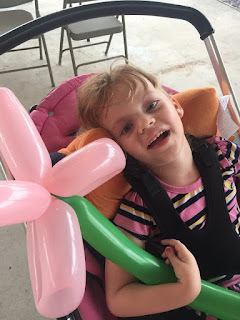 Grace continues to battle the genetic condition that affects muscle tone and nerve function with physical therapy twice a week and speech therapy once a week. While she is unable to walk and talk, the Hillsboro five-year-old continues to be a happy little girl, one who will start kindergarten at Beckemeyer this fall. Most children with INAD don't live past to see their tenth birthday, but that statistic hasn't erased all hope from the Herschelman family. Family photo plus a cute bonus nephew! 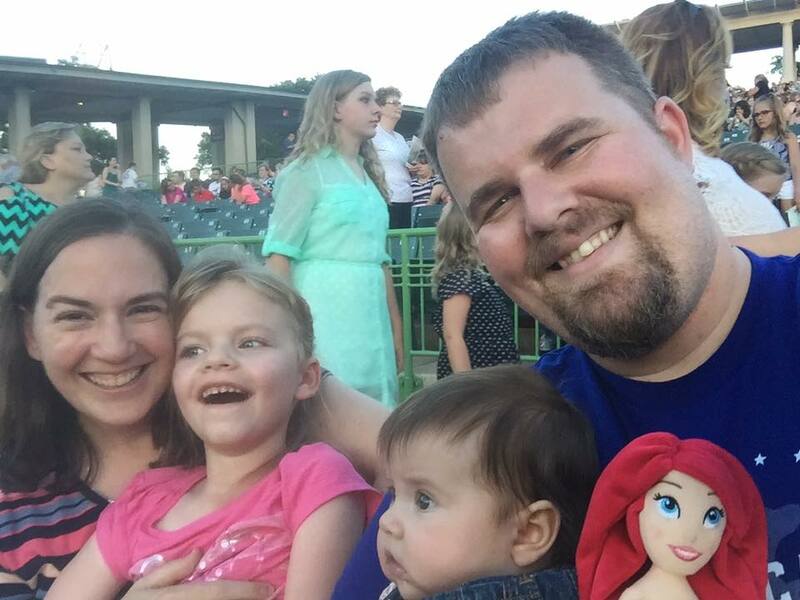 "We've made up our mind to give Grace the best life we can, whether she is with us for another day, another year or if she outlives us all," said Herschelman, who along with his wife Mary also has a three-month-old daughter, Charlotte. 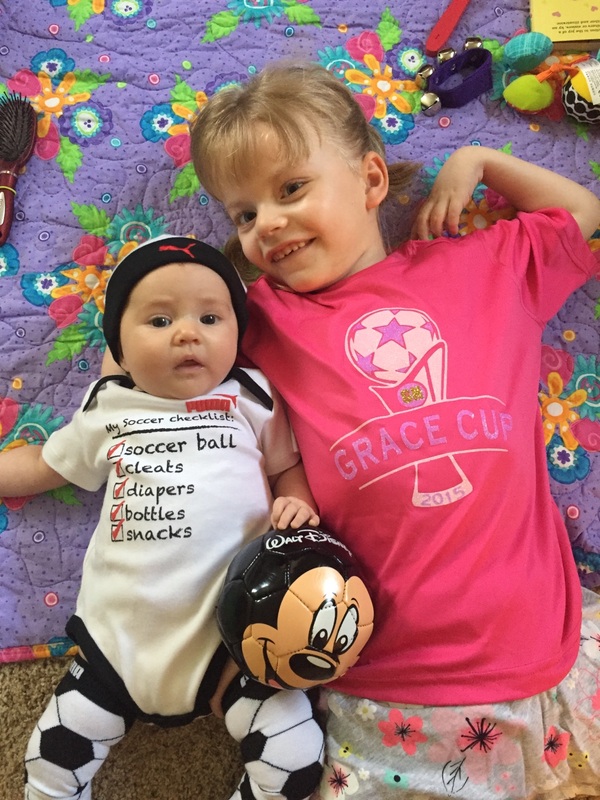 "We want Grace to have as many experiences as possible and the Grace Cup has become one of our favorites. Not just because of the game or the money raised, but because of our family and friends who help make it a truly special day." 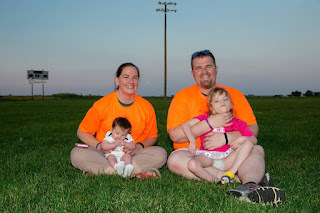 For more information on the Herschelman family's story, go to www.agracefilledjourney.com or www.facebook.com/agracefilledjourney. 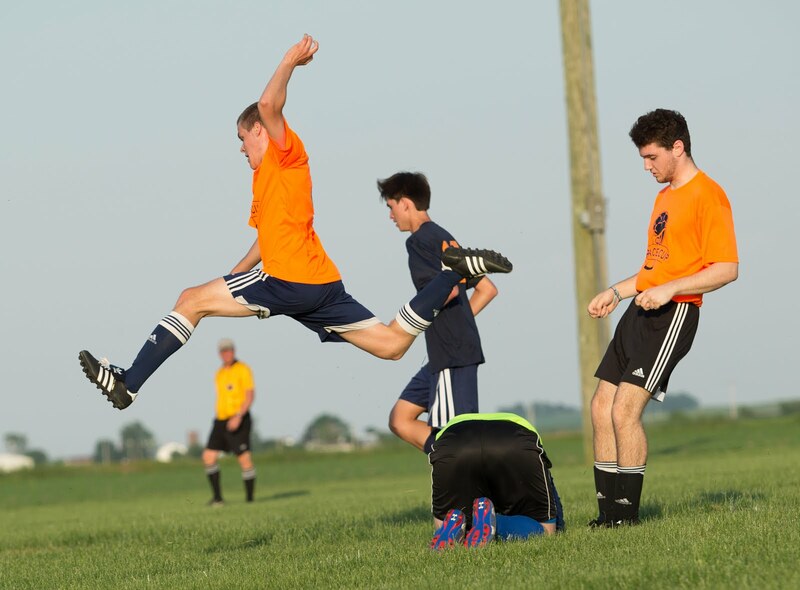 Goalkeepers: Blue Team: Noah Matthews (Greenville); Orange Team: Tyler Marsh (Riverton), Cameron Gross (Lincolnwood). 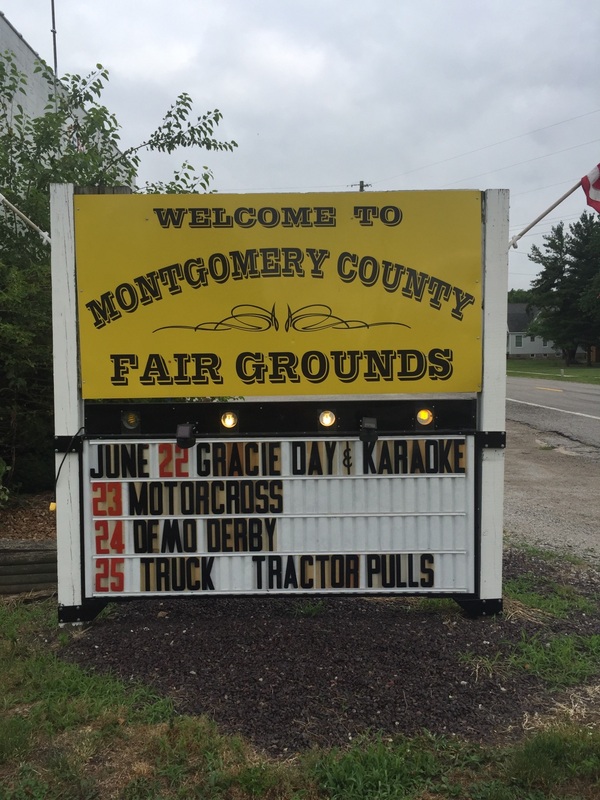 It takes more than a little rain to keep us from raising more awareness for INAD, this time, hundreds of miles from Montgomery County. 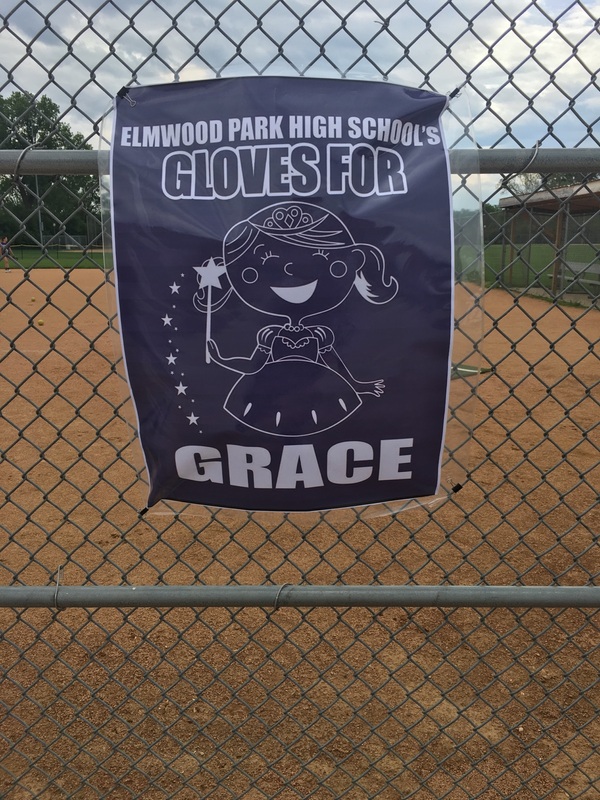 The inaugural Gloves for Grace event was planned for Saturday, May 20, at Elmwood Park High School near Chicago, and the girls and I had the chance to head north to meet the team and head coach, Dylan Mack, who has become part of our family over the past few years. Hanging out with the Vosses on Pizza Friday. It started back in December, when we were in Washington DC for my brother's promotion ceremony at the Pentagon. Dylan is married to my brother's wife's sister, and we have been blessed to get to know them at family functions. Since Kyle writes high school sports for our paper and Dylan coaches both high school softball and football, the two got to talking at one of the parties about all kinds of things sports related. 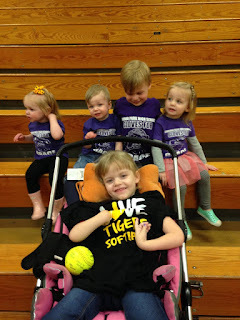 Grace was all smiles when she got to meet the Elmwood Park Tigers. At one point, Dylan mentioned to Kyle that he was interested in hosting a Grace event at his school. Emily's entire family has been so supportive of A Grace-Filled Journey since even before we knew Grace had INAD. And it was wonderful to have the chance to see them again. Grace got her picture taken with the whole team! Grace loves her new autographed softball. It was the beginning of May, and Dylan's wife, Malory, emailed to ask me about the event they were planning. She said not to worry if we couldn't come and that they would take lots of photos. As luck would have it, that was probably the only weekend in May that I didn't have anything to cover. Kyle on the other hand had regional softball and baseball championships to cover, and didn't get to join us. 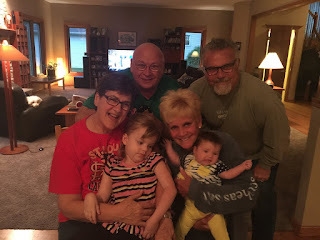 So, the girls and I made it an adventure with Grandma and Grandpa Galer. 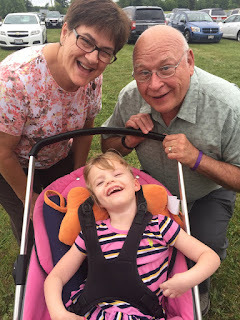 We headed north to Lombard on Friday after Grace was finished with physical therapy. Charlotte slept nearly the entire three-hour drive north and Grace watched Moana on her DVD player. We met up with Emily's mom and dad for pizza Friday, and then headed back to the hotel. Mommy and Grace checking out her new ball and reading all the names. 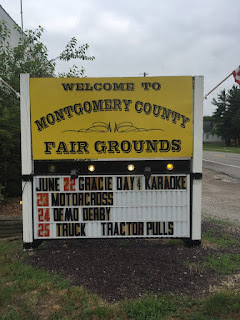 After storming all evening and projected rain in the forecast all day on Saturday, Malory called me first thing in the morning to tell me the game had been cancelled. 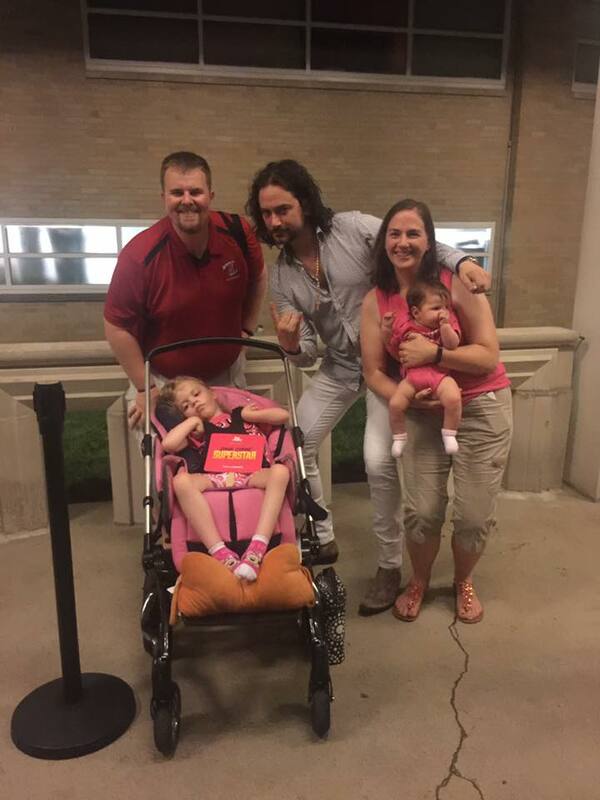 However, the team still wanted to meet Grace! 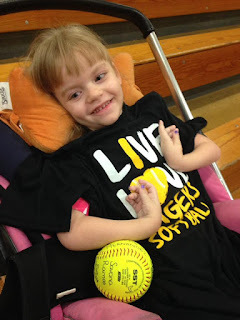 We met them at the school, where the softball team and most of Emily's family was there to greet us. Grace had lots of smiles for the girls, and they gave her an Elmwood Park Tigers softball shirt and a ball, signed by the whole team. Kyle and I are still working on a display case for Grace's autographed balls, and this one will be such a great addition! 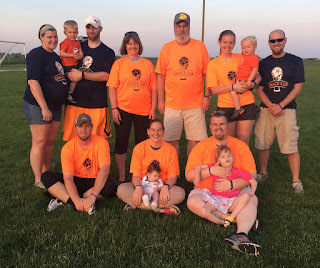 The Voss and Galer families together to #beatINAD. We made sure to take lots of photos with the team and tell them a little bit more about our story. 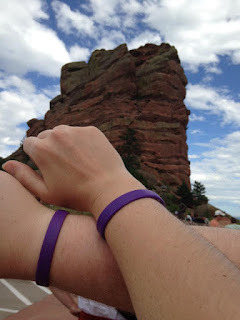 They were all wearing purple Gloves for Grace shirts that said #beatINAD on the back. 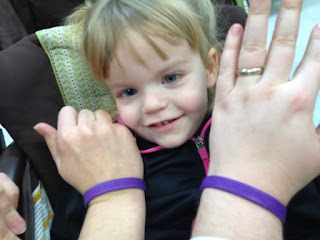 Even Emily's nieces and nephews had little purple shirts, and there was even one for Charlotte! Since the game got rained out, we enjoyed lunch with Emily's family before heading home, but we definitely missed having Johnny and Emily there with us to celebrate. Although the game got rained out, the home run derby was played on Monday! 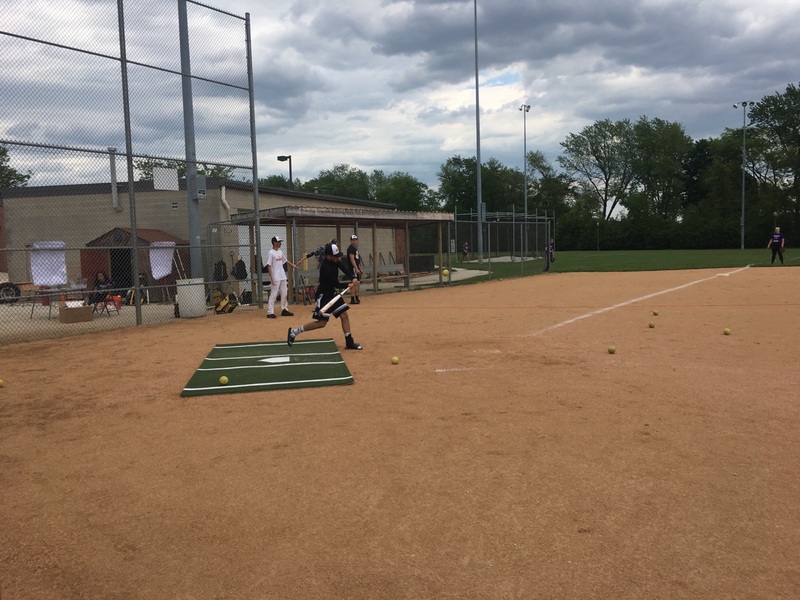 Part of the Gloves for Grace event was a home run derby that was originally scheduled after the softball game. It got postponed until Monday, and we didn't get to stay, but Malory sent me plenty of photos. She also texted me to tell me they raised $750 for INAD research and were hoping to raise even more next year. 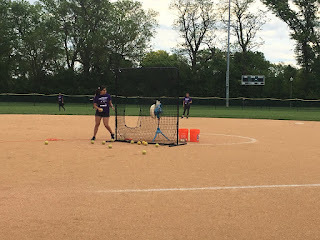 Snapshots from the home run derby. The team helped to load the pitching machine. 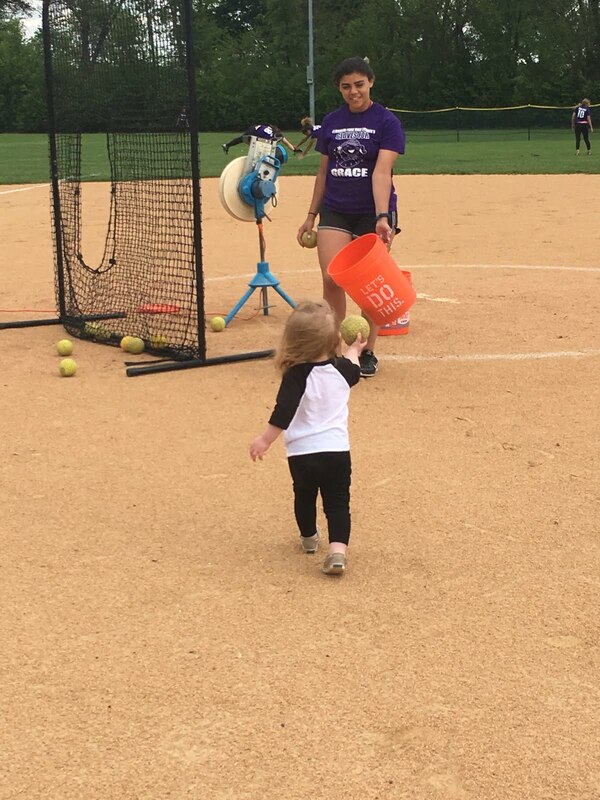 Coach Dylan takes a swing in the home run derby. We are constantly amazed and humbled by the generosity of people that we know and those that we don't. 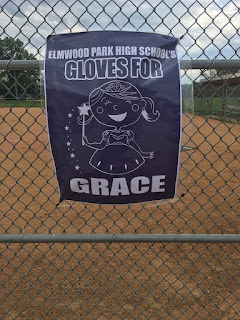 These girls and their families at Elmwood Park High School had never met us or heard or story before Gloves for Grace, but they are now a special part of this Grace-Filled Journey. 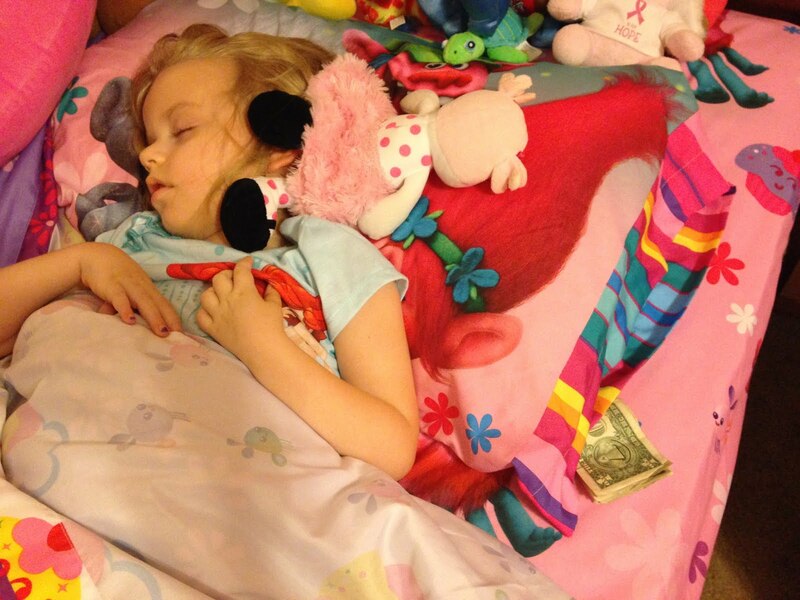 Little fans make a big difference too! Zoe helped out with the home run derby too! 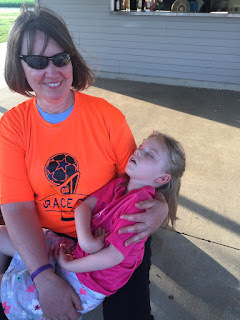 Although INAD continues to steal so many of Grace's abilities, our journey will continue to raise awareness and funding for this terrible disease. And we will be forever grateful to each and every person along the way who helps us to #beatINAD.